During the installation of WordPress an username and password is set up for you to Login to WordPress. Use the WordPress login URL link and enter your credentials into the login area. 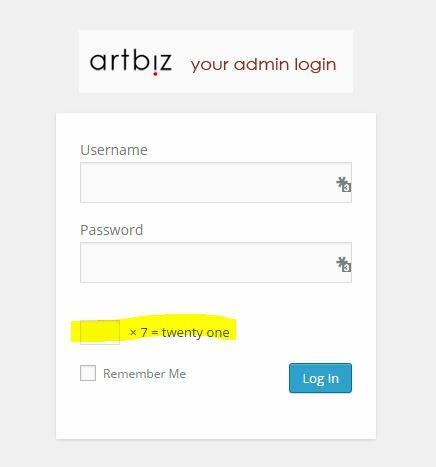 If Artbiz installed WordPress for you, you will receive all your login credentials in a welcome email. If you lose your credentials, click on “Lost your password?” and a new password will be generated and e-mailed to you. You’ll be able to change the password to something more memorable, under Your Profile, once you login. A few words about usernames and passwords. Never use “admin” as a username and always use a strong password with letters, numbers and symbols. Enter your username and password, answer the security question to prove you’re human if applicable, and click the Log In button. You can select “Remember me” if your computer is secure and only used by you. Now you’re logged in. You’ll arrive at The WordPress Dashboard – a screen that gives a range of information about your website. Let’s have a look. Just making my way through, first time! A question regarding comments — above you mention something about subscribing to the comments, but I don’t see an option on the dashboard to do this. How do I subscribe to comments? Under the “leave a comment” box there is a notice the say “Notify me of future comments by email” just check the box. Of course if you didn’t do that when posting your comment you will not be notified of mine. So I shall also email this comment to you manually.